Roaming Stamper: Color Challenge FRIDAY!! 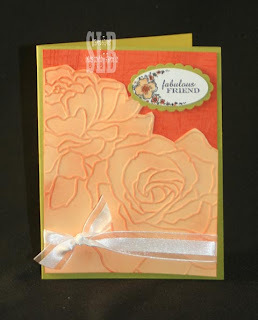 Yes, it's Friday and it's time for me to host another color challenge over at Stampin' Addicts! I'm really having fun doing this every week. It has helped we stretch my creativity and break out of the rut we all seem to get into when we are paper crafting. This week's challenge is to use: Tangerine Tango, Kiwi Kiss and Apricot Appeal. I knew when I started working on this that I wanted to use some In Colors with at least one of the Original 48 colors. I picked Apricot Appeal because it's a color I rarely use. The other colors just seemed to match it very well. As always all products are from Stampin' Up! I hope you'll use these colors to stretch your creativity this weekend. If you do, leave a link in your comment so I can see what you did! Have a great weekend everyone! I just got this folder yesterday! Can't wait to use it - your card is beautiful! You card is gorgeous. Lovin' all the orange this week. I'm on the waiting list for the HOTS retreat - I hope I get to see you there.